Kundapur, March 24, 2016 : The alleged anomalies in the semester results of degree students declared by Mangalore University, has invited the ire of the student community. 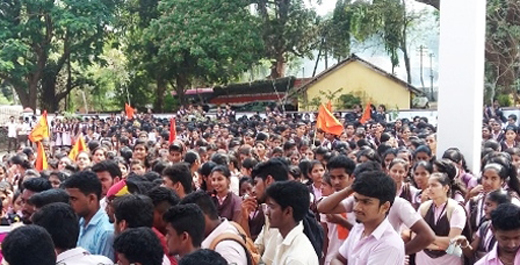 In Kundapur students of Bhandarkar’s College staged a protest on March 24, Tuesday under the aegis of the Akhila Bharatiya Vidyarthi Parishad. Speaking on the occasion, ABVP leader Rakshith warned that the students would gherao the University on March 28 if the University authorities failed to rectify the errors. He said there were serious errors in the results and that some students who have appeared have been marked absent in the results. 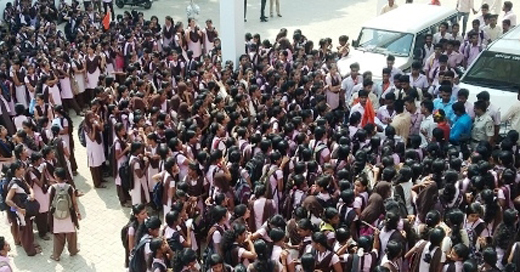 The protestors later submitted a memorandum to the authorities through the Assistant Commissioner of Kundapur. The have to concentrate on the studies and never misuse the freedom of their association ABVP. The university has to do the duty assigned carefully. The person concerned with the correction of answer papers have to be very careful as the future of the students depends on them. How can the university be so careless? They have to accept and rectify the errors.